The eastern population of monarch butterflies has declined significantly over the past 20 years. As the figure here illustrates, Iowa is in the heart of the summer breeding range for these iconic insects. Habitat restoration that includes planting native milkweed species is critical for monarch conservation. There are 18 native milkweed species in Iowa, but most oviposition information is based on data gathered from common milkweed, A. syriaca. 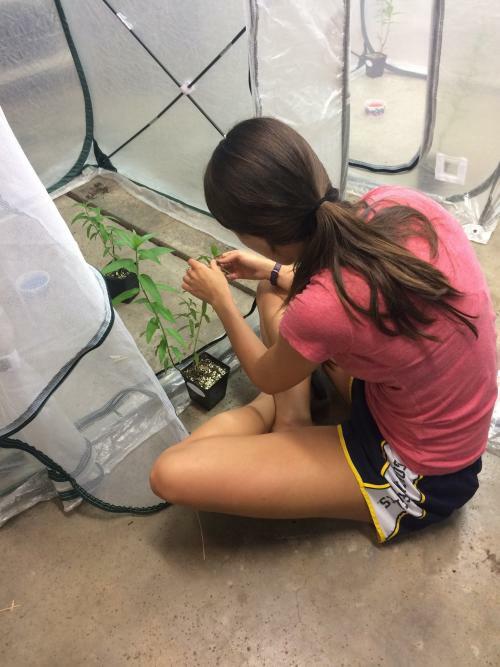 Recent research by Iowa State University graduate student Victoria Pocius took a closer look at oviposition on nine different milkweed species all of which are native to Iowa. "We estimated an egg laying rate for female monarchs on each species and then gave females a choice by exposing them to four of the most common milkweed species in Iowa at the same time," says Pocius, graduate research assistant in the Ecology and Evolutionary Biology program at Iowa State University. "The results highlight the importance of including a diversity of milkweed species in monarch habitat restorations." 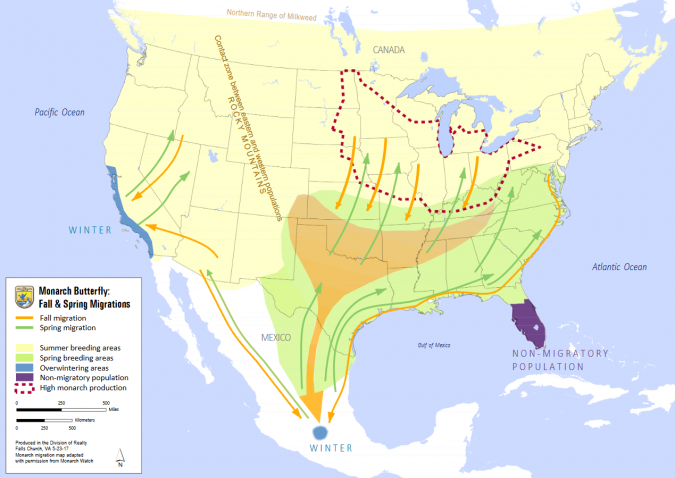 Milkweeds in the genera Asclepias and Cynanchum are the only host plants for larval monarch butterflies in North America, but data regarding females’ preference for egg laying, especially on milkweeds that have overlapping geographic ranges, is limited. Results from this laboratory experiment indicate that monarch butterflies will lay eggs on all nine milkweed species used in the study. However, A. incarnata had the highest average egg totals when females were not given a species choice (surrounded by A. incarnata plants only) and when they were given a choice among four milkweed species (A. incarnata, A. syriaca, A. tuberosa, and A. verticillata). 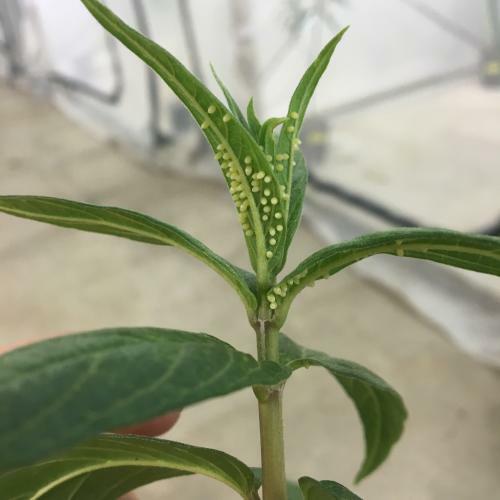 "This illustrates that monarchs will lay eggs on all nine milkweed species tested, but females laid more eggs on an A. incarnata plant surrounded by other milkweed species than on an A. incarnata plant surrounded by only A. incarnata plants” says Pocius. "These results are a first step in understanding how a diversity of milkweed species can potentially boost egg numbers during the breeding season." Research results show that although monarchs do lay eggs on all nine species, four of the nine species could be important for oviposition within habitat restorations in the Midwest assuming that each species is planted within its native range and in its appropriate habitat. Findings from this study also suggest that A. tuberosa and A. verticillata are not the best plants for oviposition, although they are valuable food sources for monarch larvae. Most importantly, females laid 2.5 times more eggs when they were surrounded by multiple milkweed species instead of only one. This result highlights the importance of including a diversity of milkweed species in monarch habitat restorations. More information about this study is available in the recent issue of Ecosphere.